ARE YOU R E A D Y ! ! ! ? ? ? ? cristiano, congrats!!!! wow, how great, can't wait to hear about the show. Someone please advise... Its 6:45 they just told us they're done at the el rey and we should go to the Fonda. Where should I wait??? If I was there I would go to where the music will be. I'm waiting in line at the Fonda. Anybody think tix will be given out here at 5:30? Do we have a better shot waiting at the El Rey? What do you guys think? Historically? Stay at the location of this show. Historically loyal and true and waiting and waiting fans, standing and standing and smiling and waiting and being optimsitic and hoping and having good luck fans have been known to be allowed into some of these shows are the very last second. Allow the unbelievers to leave.. but you stay faithful... and smile... and hope... even after it starts, and you can hear it, stay faithful.. when the crowd outside thins, they might let you in for the snd half of the show. I'm proof - happened to me twice. Shepherd's Bush and Beacon 1. I am having the same problem. Did you get a solution? I watched the last periscope, Mick and Ronnie's guitars, and had audio. I am using Google Chrome on a laptop. That's right. If you don't have audio it means your sound isn't on. Edited 1 time(s). Last edit at 2015-05-21 05:57 by alieb. I see that you decided to stay up, Nikkei? Not so much a conscious decision, I can't help it. Nothing on Periscope and they seem to have completely forgotten the supposed liveblog. Getting tired here. Come on Charlotte we are counting on you!!! Going into constant refresh mode. Send the audio to an outboard amplifier if need be. You heard ?? They usually start 45 min late. A prompt 8 pm start would seem early if I were in LA. Do we have anybody on the inside that can post live pics???? I was thinking that from the beginning. I wouldn't be shocked if they don't go on till 8:30-9. One of the Periscope broadcasts when fans were picking up those tickets sad fans weren't allowed to bring their phones in. Maybe they are checking for them? 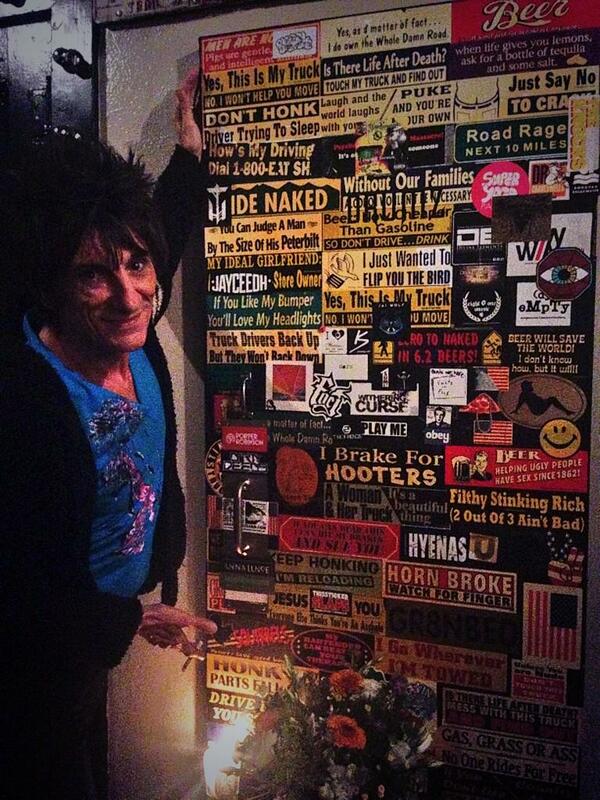 Some 20 minutes ago, Ronnie tweeted from what he called his dressing room.